On Thursday the 17th of March I flew to Athens (Greece) cause I had some things to do and I decided to take you along and show you what I was up to. 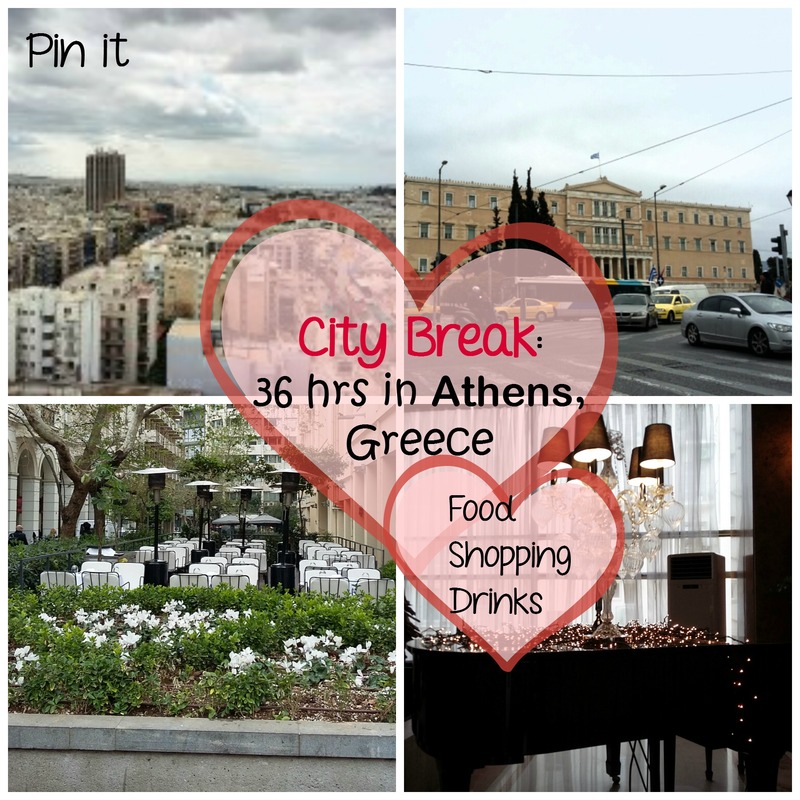 My 36 hours will be a bit different to what the typical tourist does cause, well, I have been to all the tourist attractions in Athens and I lived there for 5 years. My post will be a bit of a strolling, shopping, and coffee/food :). No museums, no galleries and no ruins (although you really have to do all those first and add some of the stuff I did).So, lets walk around Athens girlie style! I had to get up early cause my flight was at 6:45 and boarding time was 6:15. This meant that I got up at 4:45! Yeap! I was sleep walking. I was travelling with my sister. We got the plane to Athens and landed at around 7:30. It was too early to go to the hotel, so we decided to have some coffee and a toasted sandwich at Gregory’s in the airport. Gregory’s is a famous chain that has lots of sandwiches, pies and loads of coffees. We then took the bus (line X95) to Ambelokipi which is central Athens. We were going to stay at the President hotel. We paid 97 euros for a double room (breakfast included). We were on the 15th floor. I had not booked anything online, so this was the price we paid upon arrival (Booking.com was giving the room much cheaper, and when I told the receptionist she said that the hotel had lots of arrivals which was why the price went up). Anyways, not complaining about the price cause the hotel was worth it!! We freshened up and then got a taxi to the center. You see if you take the metro (which is a 10 min walk from the hotel) it costs about 4 euro and a taxi ranges from 5-7. We were both beat and old :p , so we opted for the taxi!! Tip: Taxis parked outside the hotel are more expensive than just waving one from the street. Our first stop was Ermou street which is at Syntagma square. That’s one of the central shopping areas in central Athens. Is it the most glamorous? No. But, it is outside and had some of the shops we really wantedto go to. I like Ermou. We went to M &S, H&M, Zara, MAC, and lots more. We had some coffee at a coffee shop and then did a bit more shopping. We then went for lunch at a coffee bar/restaurant. It belongs to Elli hotel which is on Ermou street. I had some really yummy ravioli and coffee. After that we went back to our hotel cause we had an appointment. We relaxed a bit and then went to Syntagma square again, this time for dinner at a Chinese restaurant called Attic Moon at Xenofontos 10. We had a yummy meal and then went back to the hotel and slept (you can check all the restaurants and hotels out on tripadvisor as well). We had a yummy breakfast, packed, and then left our luggage at the hotel reception. Again, took a taxi to Syntagma square and went to this big store called Public. You can find books, toys and anything tech related there. I got a book, my sister got some toys for my niece. If you are in the area, I definitely recommend going to the Grand Brittania for coffee or tea (luxury ❤ ❤ ). We then left to stroll down Panepistimiou street which is one of my favourite streets. Of course I did some damage in Attica department store (just a bit). Highlight of Attica was of course shoping at the Burberry counter where the Burberry makeup artist (Vasilios Gelis) showed me how to do my brows and was really really helpful (<3 <3). I felt like a doll after leaving Attica!! Full post coming soon cause I bought a few things from Burberry and learnt loads fromtheir makeup artist!!! We then went for coffee at City link (behind the Attica). This is an ‘in’ place with some coffee shops and restaurants. At around 5:30 p.m. it was time to go, so we went back to our hotel. We took our suitcases and then got the metro to te airport. It took about 40 minutes from our hotel. We left Athens at 9 p.m. and now I am back on my little island :). So there you have it guys. Have you ever been to Athens? Are you thinking of visiting? Feel free to comment below. I think the fact that I write in English confuses my readers :D. I live in Greece. I live on the island of Crete :). Thanks for stopping by!!! You’re so lucky to live so close to Greece to go for a quick trip! Everything looks lovely! I’ve never been to Athens so many thanks for “taking” us there with your blog post. Wonderful photos 🙂 I’ll have to add Athens to my places to go list. Found you via the Show Your Blog Love FB post. Your SO LUCKY!!!! OMG!!! i would love to go to Athens!! or anywhere Mythogoical! Thank you for all the awesome Posts! you make me feel like im there with you everytime you post!!! I would love to visit… beautiful scenery, cool things to experience, and amazing food! I feel like I´ve been to Athens a zillion times! haha! I don´t think there is one single aspect of the Akkropolis that I haven´t seen! :p Greece is such a lovely place! Yeap!! It is. I am glad you like it too. Then again I ❤ Germany. I have been to Frburg and Frankfurt somany times!! !